Support for Entity Framework 7 is now available. Another problem is that .NET Core does not have an implementation of T4 templates – which seriously limits where this library can be used. 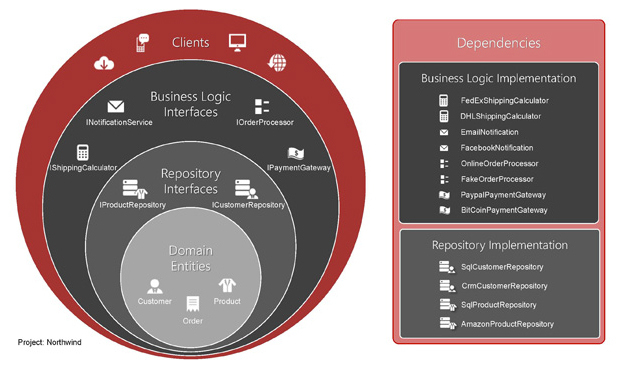 When building enterprise .net applications you should follow the Onion Architecture as outlined above. This domain model-centric approach encourages the development of maintainable solutions by integrating loosely coupled components via interfaces. Adopting Onion architecture can lead to writing lots of extra code. SSW Data Onion makes this easy by generating an Entity Framework Code First implementation for persisting your Domain Entities. 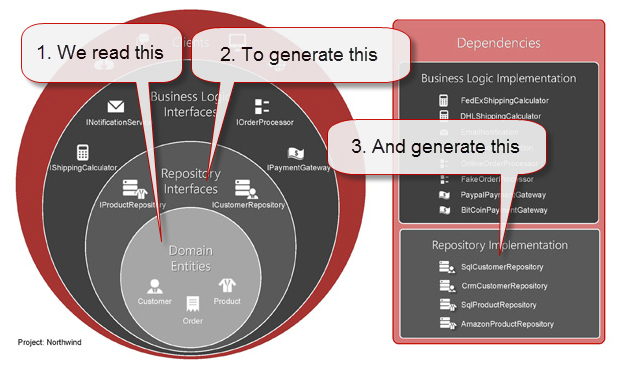 We generate a repository interface for each domain class. We generate a default EF Code first repository implementation for each domain class. The DbContext also needs to reference every class so we also generate that.